The University launched a redesigned website last week. The new site integrates social media into the web pages. 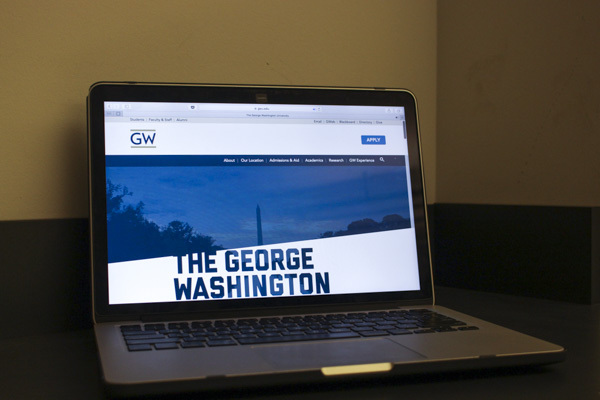 Updated: Sept. 29, 2016 at 9:50 a.m.
GW’s main website just got an extreme makeover. The University launched a new main website last Thursday that includes interactive and animated elements, after the site went four years without any major design changes. Jon Hussey, the managing director of digital marketing strategy, said the marketing and creative services staff created the new site after an increase in traffic, and they focused on adding social media, photos and videos. The marketing and creative services team has been working on the site redesign for the last year, Hussey said. The team conducted research to identify the key information their users looked for so that those features could be displayed prominently on the site. Hussey said mobile traffic to the website had tripled over the past four years. Hussey said the website has been reduced from more than 200 pages to about 40 pages. The new site should make it easier to navigate pages that users often use, like those about research, academic programs and undergraduate and graduate admissions. Throughout the site are testimonials from students and integrated social media content. The marketing and creative services staff took some of the content directly from social media and interviewed students about their experiences, Hussey said. The “GW experience” page on the website displays a virtual phone with images and captions from students’ Snapchat accounts. And the error page displayed when a page is not found shows a GIF of mascot George Washington wiping out after attempting a slam dunk. GW’s social media presence has also recently increased: The interactions on the GW Instagram account, including comments and likes, jumped by more than 10 percent between May and August. The new site looks “just as good on a mobile phone, desktop or tablet” and incorporates more photography, videos and animated and interactive elements, Hussey said. Hussey added the digital team has developed an editorial calendar for the site and plans to update content on a weekly, monthly or quarterly basis. The last time GW fully redesigned the main site was in August 2012. Staff have updated parts of the website intermittently over the past few years, Hussey said. The website was built in-house by the marketing and creative services team and the Division of Information Technology with input from departments across the University, Hussey said. Colorado State University, University of Notre Dame, University of Chicago, Rhode Island School of Design and Clemson University have also redesigned their websites within the past five years using in-house teams. Chris Weller, a web designer and developer at Colorado State University and a member of the in-house team that redesigned the university’s website this month, said that working in-house gives team members the flexibility to modify the design of the site and talk to other officers about what should be included on the redesigned site. Websites need to constantly change to be more accommodating of users accessing the websites from different devices like phones, tablets or desktops, Weller said. He said it is important for universities to keep their websites up to date for both technical and branding reasons. The Hatchet incorrectly reported that GW’s website traffic increased by 25 percent over the past four years. Mobile traffic to the website tripled over the past four years. We regret this error. This article appeared in the September 29, 2016 issue of the Hatchet. The Colonials bested their conference foe in all three doubles and repeated the feat in singles play Friday.